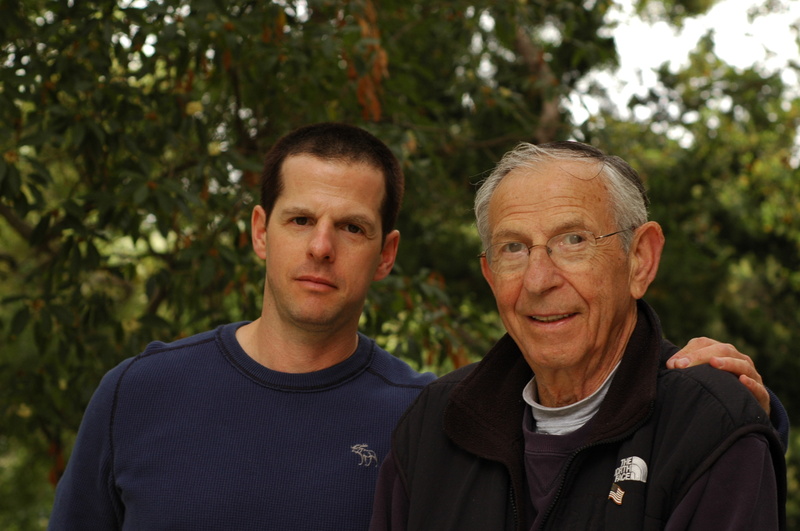 Dad and Me in Rustic Canyon. Dad and Me in Rustic Canyon., originally uploaded by hereinvannuys. In the past few years, a degenerative illness has overtaken my father in his brain. It affects his speech and balance. Countless specialists from UCLA to NYU to Columbia have diagnosed it as either Ataxia, Multi-Symptom Atrophy, or OPCA. There is no general agreement on what it is, or how to cure it. He now can only stand up and walk with a walker. He has to hang on to walls and door handles and when he takes a shower, there has to be another person in the room. Last year, the neurologist briefly prescribed a Parkinson’s drug to help his speech. It worked for two weeks until he started having uncontrollable shaking in his hands and seizures in his face. He went into the hospital and “recovered”. He came home to the occupational, speech and home health care workers who gave him lessons, at age 74, on how to tie his shoes and ask for a glass of water clearly. Chronological maturation is a return to infancy on some levels, it seems. Through it all, he has not complained. He still manages to smile and conduct his life with grace, honor, politeness, dignity and bravery. You wonder, how human beings, having lived and struggled their whole life, still manage to surmount the moral and physical strength to conduct one more battle on Earth. He is leading his children in an example of how to live with illness, and still maintain a healthy outlook. Your words will stay with me for a long time. As a reader, I’m sorry to hear of your dad’s illness. It’s difficult to watch someone you love go through this, but it sounds like both of you are dealing with it in as upbeat and positive a manner as possible. Illness is such a sad fact of life. In a hundred years or so, perhaps they’ll look back on us as a bunch of unlucky bastards who had to live through a time when these things couldn’t be turned off as easily as a forgotten kitchen faucet left running after an answered phone call. But I won’t regret the time I’ve lived in, and it doesn’t sound like you or your father will, either. Beautiful words from a loving son. ← Marco D on L.A.